Imagine your students' excitement as a pumpkin patch magically springs up on your playground. That's right, our traveling pumpkin patch and petting zoo comes right to your school. Instead of going on a field trip, why not have the farm come to you? 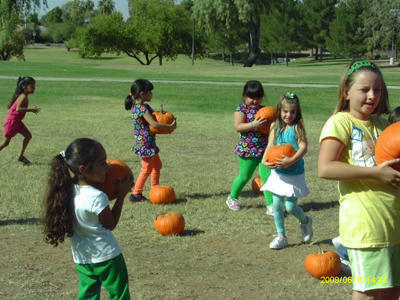 We will bring the pumpkins and the hand-tamed farm animals for your kids to enjoy. It is a fun and educational experience for everyone. For larger groups we can even add pony rides or inflatables to make it a whole school event! Need more information, pricing or want to make reservations? If you believe your child's school would like this activity please share on your favorite site! Each child will spend time in our petting zoo; enjoying a variety of hand tamed farm animals. Then each will pick out their very own kid sized pumpkin. Take advantage of our visit to teach your students about various animals as well as life on the farm, close up and hands on. Avoid the long hot bus trip that usually accompanies a field trip. Forget about the hassle coordinating parent volunteers and chaperones. No crowds to navigate through. No fear of loosing track of children. No potty breaks in unfamiliar surroundings. We bring the farm to you! We set up our portable petting zoo on the school grounds. Your students do not need to leave campus to pick out a pumpkin and enjoy a visit to the farm!